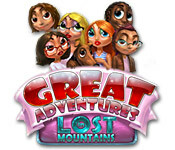 Great Adventures: Lost in Mountains is rated 3.8 out of 5 by 18. Rated 5 out of 5 by Beesy from Wished it was longer - where is the sequel? I loved this game as it is a different type of game - having to solve quests. Downside though is you can play it in only a few hours. Would love the developers to release a sequel - just make the next one longer please! Rated 5 out of 5 by AdrianaIP from A charmer This is an adventure games (no HOS) of the type "find the key, unlock door, explore, pick up what you need" It does not take itself seriously. It is a cartoon, and gives you and overview of the aread (and thus you do not need a jump map - you just grab your character and drop him where he or she needs two be). There are two characters, a female scientist, and a male mechanic. The mechanic will do the heavy lifting stuff that needs strength, while the scientist will figure out how to make machines work, how to hack into locks, and is also nimble enough to squeeze through tight spaces. So you have to switch between them. You have to keep them fed, rested, and enterained - which means getting the remote control of the TV and finding the records for the record player. It is delightful to look at, and you can on top of what you need you can pick up bones to get more hints, or fishes, butterflies, ladybugs, oriental lanterns and firewood - which makes the place nicer and makes the characters less tired and bored. I played it three times already. I will rest it for a while, and probably will play it again in a couple of months when I need a few smiles. Rated 5 out of 5 by tutortime from Enjoyable game to play. I found this game today and I think it must be an older game. The graphics are good, colors bright and you can choose your characters. 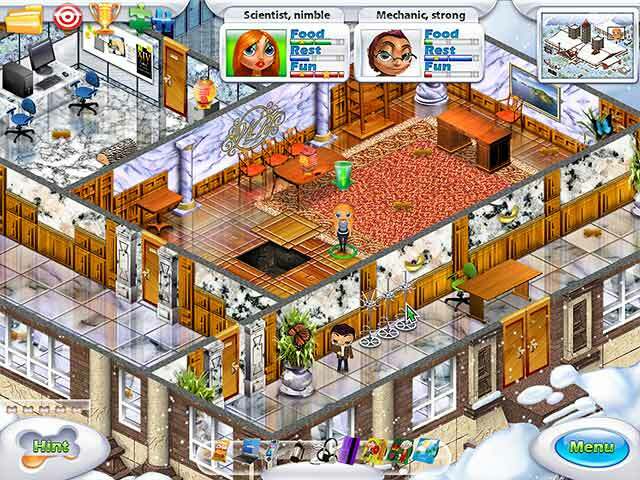 Simple storyline and you are kept busy exploring new areas and collecting items. It plays quickly and I finished it after a few hours. I enjoyed it it. I used my coupon, so its a free game for me. It would be a great for the developers to create a newer game based on this concept. Rated 5 out of 5 by GoldieFish33 from Casual Adventuring! I'll almost always go for a time management game but this one caught my eye. I agree that the minimal dialog was a plus. There's some discussion between characters but it's always related to the game play in the form of hints or story line. I got stuck a few times but there are helpful hints to guide you along the way. I thought the lack of a doomsday feel was great because you're able to complete a mystery/adventure free of pressure or anxiety. On the other hand I finished this game within a few hours. I also thought the characters looked disproportional although others enjoyed the cartoon design. Try the trial you might love it! Rated 5 out of 5 by haleydaws458 from So cute! I loved this game - it's so different from all the typical doomsday, heavy games out now with all the H/O scenes & talking, etc. Here, you find little things here and there to help you get into the next room, uncovering the next part of the hotel, etc. It's annoying at first, having to feed the characters & let them rest, but soon you find things (bag of chips, etc.) that they can use so that nothing slows down. My niece & nephew love this game, but I do, too - & the best part is how different & original it is. I'm kind of tired of the same old thing sometimes! Rated 5 out of 5 by ironic_beauty197 from Cute & Fun I really enjoy interactive adventure games and this one certainly fits the bill. The graphics are sharp and cartoonish, the storyline is unique and interesting, and the music is calming but may get repetitive to which you can turn it off. The basic premise is to find objects that will open new areas to explore. 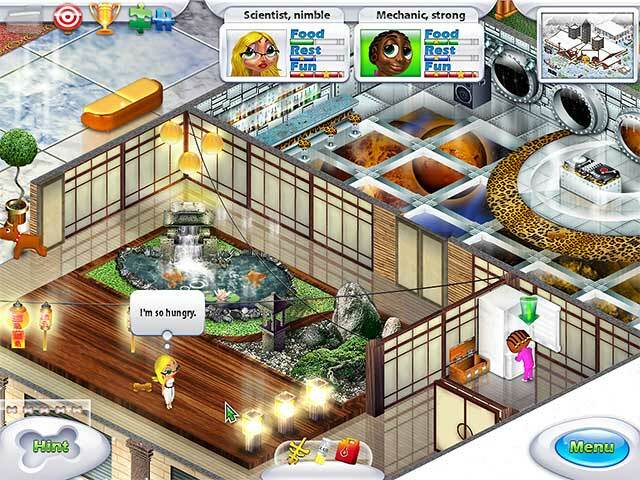 There is a sim element to the game and you will need to keep up with rudimentary needs like hunger, rest, and fun. It isn't over tasking though and simple to maintain. You have two characters in which to play simultaneously with for tasks that are geared towards one or the others strengths. The game controls are somewhat annoying as it is easy to accidentally click on objects you've already clicked on but it isn't major. The map seems to be relatively large but I haven't completed the game as of yet. Over three hours into the game and it seems like I'm still just getting started. Some tasks are not that easy to figure out but the hint button is regenerated by finding doggy treats and there are tons of them just laying around. The crisp graphics makes for easy searching even for small objects. There is no HO scenes in the game as it is all search in world for single objects or ones to combine. All in all this is actually a very fun game despite some of the unfavorable reviews. It is certainly worth the investment of one free hour! Rated 4 out of 5 by turnedtiara from Liked it but disappointed I played the trial hour then decided to buy it. Very disappointed that it lasted about another hr or so and I was done. I payed $7 for that. SMH other than that it was a good game. Rated 4 out of 5 by Roselori3 from Good but way too short! Fun game....but it only takes a couple of hours to play through. Wish it would have been longer! Rated 4 out of 5 by mrm2006 from Nice Game - just not for me. I'm not even sure what kind of game to call this ... a SIM???? After entering your profile, click "play" and you will be able to choose 1 of 3 female characters and 1 of 3 male characters. Each character has different traits so choose .... wisely (?). The story line is interesting. Dad is a famous Professor and was at a convention but the hard snowfall has required everyone to be evacuated. He called you and said to get there asap because he was in trouble. The phone went dead .....you could not reach him again! OH NO! Off you go, with ..... your counterpart (partner? husband? ????) in the snow ..... where everyone else is LEAVING! Hmmmm. Then, you FALL off the mountain in your van but land ON YOUR TIRES in a parking spot!!! O-k-a-y then. The graphics are really, really good for this type of game. The music was soothing and relaxing, which I guess is needed because the game play started to stress me out. lol. There are limited sound effects (fridge opening, music playing) and while there are no voice overs, there is a dog that runs everywhere (including providing you with hints that you DON'T need to use your "bones" for) who barks all the time. I would have loved to have named this little guy. The gist of the game appears to be that you go around the entire area looking for dad, among other things. Pick up bones scattered about to earn a hint. Pick up random items because you may need them later (i.e. batteries, glue, etc.). Make sure to find your way to various key locations to eat, rest, and have fun. It's important to keep those "qualities" at a high percentage. Told you this isn't my kind of game. While I enjoyed playing the game, it just wasn't for me. I get all wonky-eyed and dizzy-headed moving characters from room to room and back and forth again and again. And, truly frustrated when I can't find something or it's within easy reach but the door is locked and I haven't got a key! For these reasons, this will not be a purchase for me. However, I highly recommend this game for everyone. It has a lot of entertainment value, is fairly slow-moving (due to all the walking around you do) and who doesn't want to rescue poor dear dad??? Join ..... the dog (?) and head to the snowy mountains for what appears to be a great mystery and adventure! ENJOY! Rated 4 out of 5 by GailPeng from Fun Advanture Game! It is a small funny game by finding all required items following the track of an interesting story. It is easy, relaxing, and with nice cartoon figures. Very good for spending a little time during weekday evening without consuming too much time.